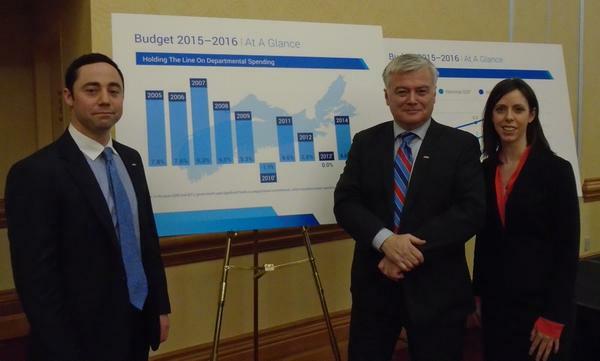 Left to right, Nick Langley, CFIB Director Provincial Affairs Nova Scotia, Jordi Morgan and Erin McGrath-Gaudet, CFIB Director Provincial Affairs for PEI and Intergovernmental Policy at Nova Scotia Department of Finance 2015-2016 Budget lock-up, April 9, 2015. Finance Minister Diana Whalen delivered a budget which she says will set a path for economic growth. Perhaps, but there’s still a lot of work to do, especially getting public spending under control and providing much needed clarity on taxes. The Canadian Federation of Independent Business (CFIB) was very pleased to see there was no increase in the small business tax rate…yet. Unfortunately there are still many question marks as the Finance Minister is looking to further review taxes in the months ahead. This budget also did nothing to address many of the recommendations highlighted by CFIB and the Tax and Regulatory Review including the reduction of personal income tax, elimination of “bracket creep” (indexation of tax brackets with inflation), raising the small business tax threshold or reducing the general corporate tax rate. Another disappointing feature was the reduction of the Non-eligible Dividend Tax Credit to 3.5 per cent, from 5.87 per cent. This will extract another 30 million from small business owners. The action was taken to correct what was essentially an oversight of not aligning the tax credit with the small business rate which should have been done for the past three years. This means many small business owners who pay themselves in dividends will be hit hard in 2016 by these changes. CFIB hopes the government will offset this tax increase by raising the small business tax threshold in the next budget and implementing small business tax reductions when the budget is balanced. The budget also included some much needed trimming of the public service through the re-structuring of departments. The Finance Minister indicated a new Ministry of Business, recommended by CFIB, the Tax and Regulatory Review and the Ivany Report, is designed to save money, streamline services and encourage more private-sector economic activity. We are hopeful this department will operate using the principle that changes to the tax system must be predictable and consistent to allow time for small business to transition and avoid the chaos created with the removal of the Film and Digital Tax Credits and the Dividend Tax Credits. This new department will also include an office to deal with regulatory reform which we hope will provide direction and political accountability to red tape reduction. At one time, Nova Scotia was a leader in reducing red tape, it’s hoped this new structure will again both measure and publicly report its activities. CFIB will be monitoring this department closely and hope to work with the government to see meaningful reform. CFIB has also been advocating for a reduction in inter-provincial trade barriers to cut down on regulatory interference when doing business between the Maritime Provinces. A commitment was made prior to the budget by the Premier that this new office will work closely with New Brunswick to address these concerns. We hope the Premier and the new Minister will also be reaching out to their counterparts in PEI and Newfoundland and Labrador. So, while small businesses are pleased to see some financial restraint, CFIB remains very concerned about the level of spending in the public service in Nova Scotia. Public sector wage and benefits are outpacing economic growth leaving a deficit and debt burden which is clearly unsustainable. Had previous the government not committed to these generous settlements, the Finance department indicated Nova Scotia would be reporting a $200 million surplus this year. Over 81 percent of small business owners when asked what the Nova Scotia government should do to balance its budget said reduce the size of government and 61 per cent said reduce spending. With significant labour negotiation ahead, CFIB is recommending the government hold the line on public sector wage and benefit settlements. Previous PostPrevious Premier McNeil, please don’t raise taxes on small business.